The SprayVantage 3 is a powerful, portable HVLP sprayer system manufactured by Binks, a division of ITW Industrial Finishing. Powered by a 3-horsepower compressor, the SprayVantage 3 generates up to 100 psi, offering high efficiency with controllable airflow. 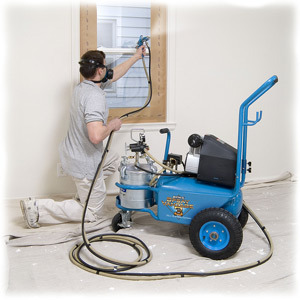 Suitable for finishing a variety of wood and metal surfaces, the sprayer is designed to apply latex, enamels, stains, multicolor paints, lacquers, varnishes and adhesives. SprayVantage 3 systems include a 2.8-gallon pressure tank with dual regulators, 25-foot air and fluid hoses, and a choice of spray guns. The unit is also mounted on a cart for maximum portability.